Any mini book fans out there? Any Summer Fun mini book fans out there? Any one want to win a Summer Fun mini book out there? If so, today's your lucky day! This mini book is your giveaway of the day for the I Love It All blogaversary celebration. There are just a few left, so if you don't win you might still be able to snag one! me that you have in your comment. 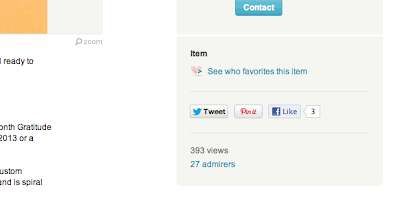 item listing has a PIN button in the right hand sidebar as in the graphic below. Etsy item listing has a Like button in the right hand sidebar like you see in the graphic above. + SHARE your mini book ideas with me. Already 'like' on Facebook!! Thanks for the give-away!!! Shared this book: Mixed Media Daily Documenting Notebook on Facebook....I love junk journals! I now follow your Blog too!!!! I LOVE mini books and junk journals....esp. made out of re-used, found, and upcycled stuff....would love to see how you would incorporate upcycled fabric into your books! Thanks again for a chance to win one of your fabulous books!!! I 'Liked' The July-Dec. Gratitude Journal on Facebook. I started a mini book about the different countries at Disney's Epcot. I will have to take some pictures of it. I used the Teresa Collins travel line and mixed in a collection of Disney postcards and I am slowly adding in pics we have taken over the years while visiting. Here's one of my pins. whoops, I had it saved under "charisma's room" instead of "journal & notebooks"
I like the 365 gratitude journal for 2013. I'm so indecisive when it comes down to the binding of my mini books that its the last thing I do! Then when I'm almost done I'll either use binder rings or stitch it up, depending on how thick the pages are. Another fun giveaway! I'm a fan on FB--Savannah O'Gwynn. I am a follower of I Love It's blog. Wow, I had pinned one of your mini albums the other day, and I shared it on FB. It is the 2013 Grateful Journal. My FB & Pinterest name is karenjcd. love all your mini album..have pinned many of them.. I like your gratitude album... what an idea to be thankful everyday and to record it... WOW! I love travel mini books, or a mini recipe book! I liked the map journal... It's so cute and perfect for a road trip! I'd love to win a mini because that is the one style that I struggle to create. LOVE them, but I never quite get the album together easily. I have already "Liked" you on FB. I recently signed up to be a "Follower". I shared the month in review 2013 today on FB and I did the gratitude journal the other day. I love all your mini albums though. I "like" ILIA on Facebook! I follow (stalk) your blog. :) LOL! I chose the following -- though I could pin all your minis to my board!! My mini idea -- I'm going to use the new destinations line by Simple Stories to do a book similiar to the one you made for Mr. WRight for your recent anniversary for our trip to AK in August. I'm thinking I'll probably use my bind-it-all instead of sewing it, though. That will (hopefully!) give me more room for ephemera I collect and pics I take! HI ! I follow your blog ! And I Follow you on Facebook too ! i ´ve pinned this on my boardhttp://media-cache-ec0.pinterest.com/upload/267682771572404838_y26EusvD_c.jpg... love it ! I love the December Daily mini album concept. It really helps to keep things appropriately focused during the holidays. I've also made "10 Favorite Things" mini albums for my kids at various ages which are really fun to go back and look through. I'm hoping to do a Photo a Month (or a week?) mini album to capture a glimpse of our lives now.